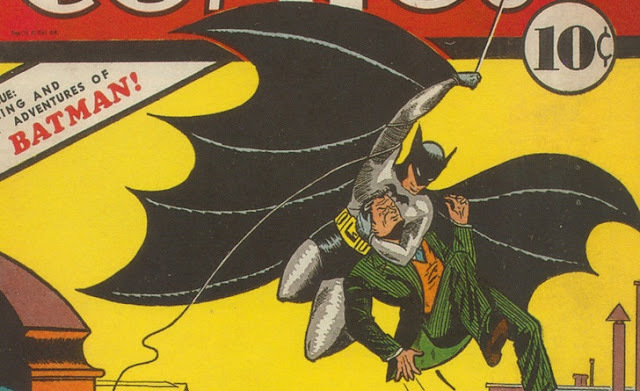 Created by Bob Kane and Bill Finger in 1939, Batman made his first appearance in a short six page story in Detective Comics #27. In the story "The Chemical Syndicate", We find Commissioner Gordon and Bruce Wayne at Gordon's house when he receives a call about the murder of one of partners at the Apex Chemical Company. Both Gordon and Bruce Wayne go to investigate. After Gordon gets a call from another partner that's scared for his life, Bruce excuses himself to go home and let the Commissioner do his job. Well, to make a short story even shorter, Batman stops a murderous partner in the chemical company and saves the day. Spoiler alert, Commissioner Gordon's pal Bruce Wayne is Batman. It's a fun piece of comic history and if you'd like, you can read the story here at reading-room.net. 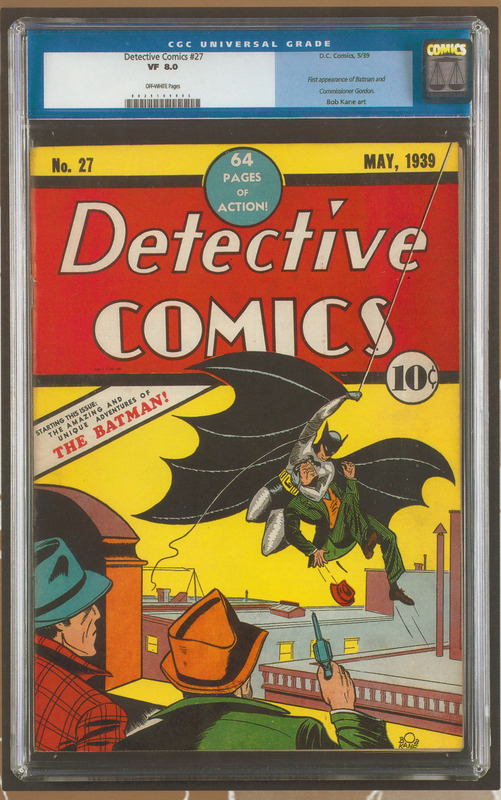 Detective Comics #27 is one of the most expensive comics of all time. An 8.0 copy was sold in 2010 at Heritage Auctions for over a million dollars. There is also an Allentown Collection pedigree copy that is said to be the nicest copy ever. I'll be getting more into the Allentown Collection and other pedigrees soon, but let's get back to the topic at hand. The Allentown copy is estimated to be a VF/NM 9.0. I'm not 100% sure, but I don't believe that this copy has been graded yet. If anyone knows for sure, please let me know. Ok, let's take a look at the CGC census. 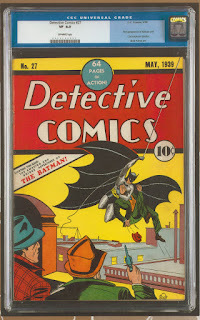 There are a total of 65 copies of Detective Comics #27 graded. However, almost half (32) of those are restored copies. Even the highest graded 9.4 copy is restored. It will still be a very expensive book, even in a Restored grade. But there is a Universal 9.2 copy on the census. Is this the Allentown Collection copy? I don't know for sure. I couldn't find any other information on it or any sales records through my research. This is a comic that would definitely sell for well into the millions of dollars if it ever makes it to the market. It may even sell more than the Action Comics #1. Most Universal grade copies are graded 6.5 by CGC. But these copies still sell over the $500,000 mark. To date, there have been zero sales of graded copies listed on goCollect.com, but their data only goes back to 2010. This is not going to be an easy book to find but, if you're in the market for this comic, and can afford it, it's going to be a great investment in any grade. I wish you luck on your hunt.